- Publisher Car Park Parables - Old Mr T. and Friends. The Stories of Jesus with cars in them. This DVD features five parables of Jesus delightfully re-told by cars in a Church car-park. The DVD features animated pictures with narration. 30min run-time. Written especially for young boys more interested in cars than bed-time stories they will delight boys and girls of all ages. Great for families, worship and children's ministry. Google 'Carpark parables' for more information. 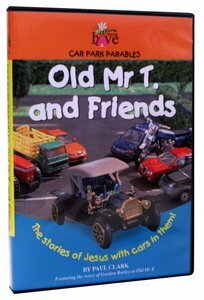 About "Old Mr T. and Friends (Car Park Parables Series)"
Car Park Parables - Old Mr T. and Friends. The Stories of Jesus with cars in them. This DVD features five parables of Jesus delightfully re-told by cars in a Church car-park. The DVD features animated pictures with narration. 30min run-time. Written especially for young boys more interested in cars than bed-time stories they will delight boys and girls of all ages. Great for families, worship and children's ministry. Google 'Carpark parables' for more information. Paul Clark is married with two kids. He has nearly 20 years experience in children's and youth ministry having worked in both the city and rural areas. Paul has a knack of sharing the gospel message, simply and profoundly through story - something he is very passionate about. With 10 titles to his name, and more on the way, his resources are down to earth, Australian, and to be watched! The Car Park Parable series are designed with boys in mind. Ever wanted to tell them a bible story, but they just want the car stories? Try this series! In Follow Me Old Mr T takes the cars on a journey to find out what it really means to follow. Car Park Parables is a series of Bible stories for kids told with cars in them! The Car Park Parable series are designed with boys in mind. Ever wanted to tell them a bible story, but they just want the car stories? Try this series! When Lucy brings someone to church for a baptism, Impossible Issi laughs at the idea. ?All you need is some petrol and good tyres!? But when Issi?s day goes all wrong, even he is looking for a fresh start.